It’s all a bit overwhelming for Chris Mann. First there was that little television show he appeared on, something called “The Voice,” where he was a member of Team Christina Aguilera. Then there was a performance on that same show of the beautiful standard “You Raise Me Up,” which inspired a moment where the judges and audience couldn’t raise themselves up fast enough to give a standing ovation. And then not long after “The Voice” was an audition that landed Mann the title role in the national touring production of Andrew Lloyd Webber’s “The Phantom of the Opera,” a production that comes to San Francisco wholly reinvented. It’s been three years of go, go, go for Mann. But then when the stage lights go off and the crowds disappear, does he think about the magical run he is on? Wednesday, Aug. 26th is when “Phantom” returns for its latest run, albeit a differently designed one. While the show has come and gone through the region over the years, it was its five-year run from 1993 – 1998 that solidified its place as the longest Broadway show to run in the Bay Area, with the open-ended run of “Wicked” coming in a distant second at 17 months. Mann is certainly thrilled to be taking part in this latest challenge. A native of Wichita, Kansas, Mann grew up with a solid theatre background, but has moved towards more straight vocal performance. The opportunity to play the misunderstood and hardened musical genius has been an opportunity to exercise other skills. “What I most enjoy about playing this role and performing in this way is that I am using my full body to do it,” said Mann. “I am more used to standing there to croon and sing, but Phantom is such a physical role who goes through every emotion in the book. Mann has been with “Phantom” for the past eight months, but it had been ten years prior since he was last on stage. Taking on such an iconic show that has been seen throughout the world, beginning with its 1986 debut on London’s West End, is a daunting task. The list of iconic performers to take on the role is long, starting with probably the most iconic voice that lives on the original Broadway cast recording, Michael Crawford. For Mann, he has worked hard to find a through line in the character that is all his own, an opportunity to shed new light on the enigmatic Phantom. “The thing that I bring specific to me comes at the end, when I really try to find a sense of compassion,” said Mann. “I really love being able to portray that. When the Phantom is broken down, my voice sort of moves into a more current delivery. 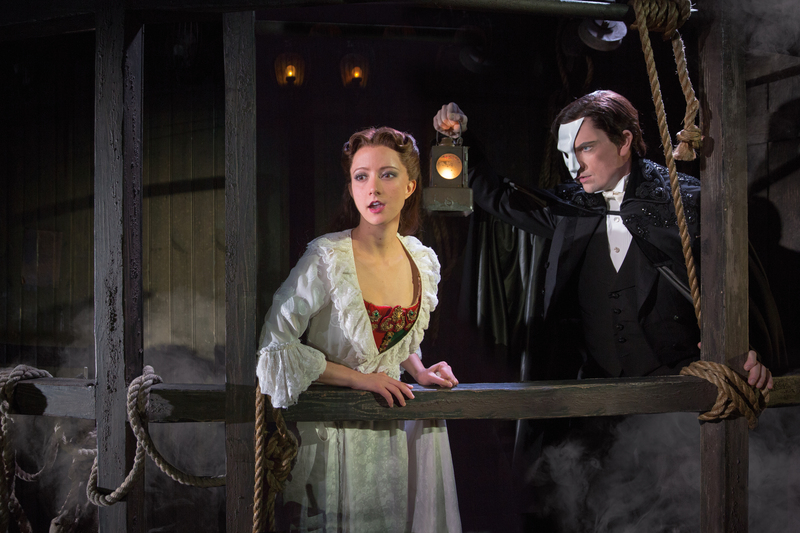 I try to find a more contemporary Phantom that hasn’t really happened yet. Mann is certainly excited to be back in the Bay Area, where he has experienced his share of important personal and professional milestones. He played a concert at Yoshi’s about a year ago, helped to light a Christmas tree in Union Square and got engaged to his wife in Napa. Although he has plenty of affinity for the Bay Area, one of his favorite moments in the show is the same no matter what city he is in.